The Coen brothers’ next offering, Inside Llewyn Davis, sees Oscar Isaac orienteering through the New York folk music scene in the frosty winter of 1961, faced with numerous obstacles preventing him from becoming the musician he aspires to be. Carey Mulligan, Justin Timberlake and Coen brothers’ favourite John Goodman are also involved in the drama led by the somewhat unfamiliar Isaac, who has fleeted around various projects in minor roles over the last few years (such as Robin Hood, Drive and The Bourne Legacy) and who has yet to find himself in that stand-out role which would propel his career to the next level. Perhaps this is the role. Carey Mulligan has been fairly busy over the last few years, also having appeared in Drive (albeit in a more prominent role than Isaac), having conjured up a critically acclaimed performance in Shame during the same year, and having recently starred opposite Leonardo DiCaprio in Baz Luhrmann’s take on The Great Gatsby. I would rather not give too much away (even though the trailer does to an extent), but Mulligan is set to portray a character unlike her those we normally see from her. The ever-so-popular Justin Timberlake has just released his third studio album and appears to be combining his musical tendencies with his acting ability in this music-driven drama. Although we do not know too much about his character in Inside Llewyn Davis, Timberlake has more than proven to be a charismatic screen presence in the past, and therefore should fit in aptly in this instance. John Goodman always has something enjoyable to offer in each film he is a part of, be it as the enigmatic “Big Dan” in O Brother, Where Art Though? or more recently, as Hollywood make-up artist John Chambers in Argo, and this time around appears to be no different. Inside Llewyn Davis, scheduled for a nationwide release in the United States on December 20th, before an agonising months wait for us in the United Kingdom, was screened at the 66th annual Cannes Film Festival in France back in May, where it received mostly positive reviews from critics. The film is being heralded as one in a similar vein to O Brother, Where Art Thou?, staunchly comedic (true to the Coen legacy), yet respectful to the era it faithfully depicts, and melancholic by way of its musical demeanour. In fact, the soundtrack to the film is one influenced by the same man who worked on O Brother’s soundtrack, T-Bone Burnett, suggesting a similar tone to the one provided in the Coens’ 2000 comedy starring George Clooney. Mumford & Sons frontman (and Carey Mulligan’s husband) Marcus Mumford is even set to chip in with a number of songs. 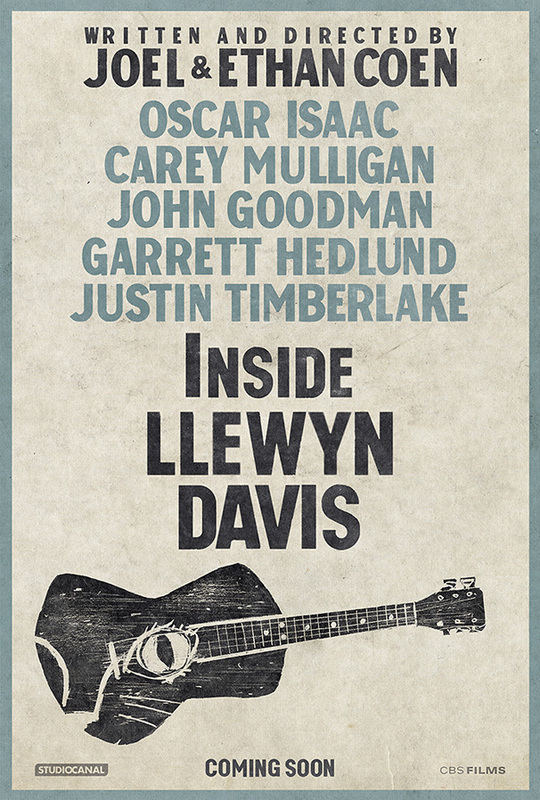 Music has always played a significant role in Coen films, therefore I have high expectations for the music set to be provided by Inside Llewyn Davis — it is a film galvanised by music, at the end of the day. The Cannes Film Festival has been one which has produced many highs for the Coen brothers over the last twenty years, with eight Palme d’Or nominations attached to their films, one of which was a win (Barton Fink in 1991). Even though Inside Llewyn Davis did not win this year, that is not to say it is a step down for the Coens, but rather that the festival went for something different (a lot different, in actual fact — look up Blue Is the Warmest Colour). Inside Llewyn Davis is even being tipped as one to look out for when the awards season comes back around early next year, although this is hardly surprising considering the brother’s films tend to be in the mix as soon as they are released. I have been looking forward to this one since it was announced months ago, even raving about it on Twitter a few times. Being a big fan of Joel and Ethan, it is always intriguing to follow the progress of their upcoming films, and all of the indications point towards Inside Llewyn Davis being another winner from the pair: set to offer up a rich, mesmeric, humorous tale surrounding a week in one man’s journey towards gaining recognition in the New York music scene. Below is the most recent trailer for Inside Llewyn Davis. It is fairly lengthy at over two and a half minutes long, and it gives a little more away than I have done here — much like most film trailers these days (Fast & Furious 6 literally gave away the whole film in its trailer) — but it by no means spoils anything. If you want to know a little more and see the characters in action, have a watch.